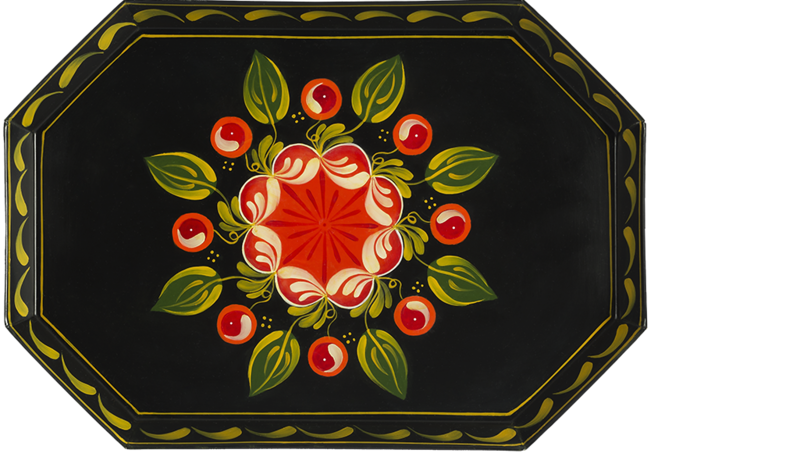 This decorative painting technique was popular during the 1837-1901 reign of Queen Victoria. 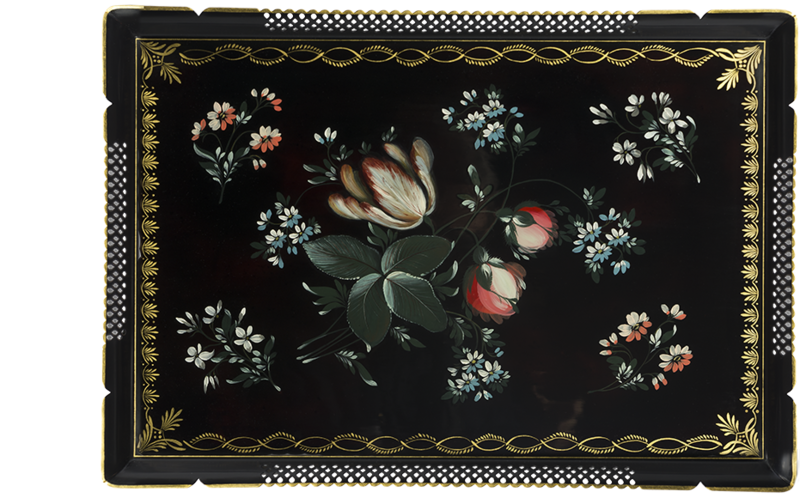 Flowers, birds, especially birds of paradise, peacocks, fountains and fruits were realistically rendered with layered base coats and transparent paints adding color and great depth. The brightest highlights are added last, usually with white. Mother of pearl is often found in these designs, and a bronzed background is often included. The painting is often framed with an arabesque scroll, which can be any combination of paint, freehand bronze, and/or gold leaf. 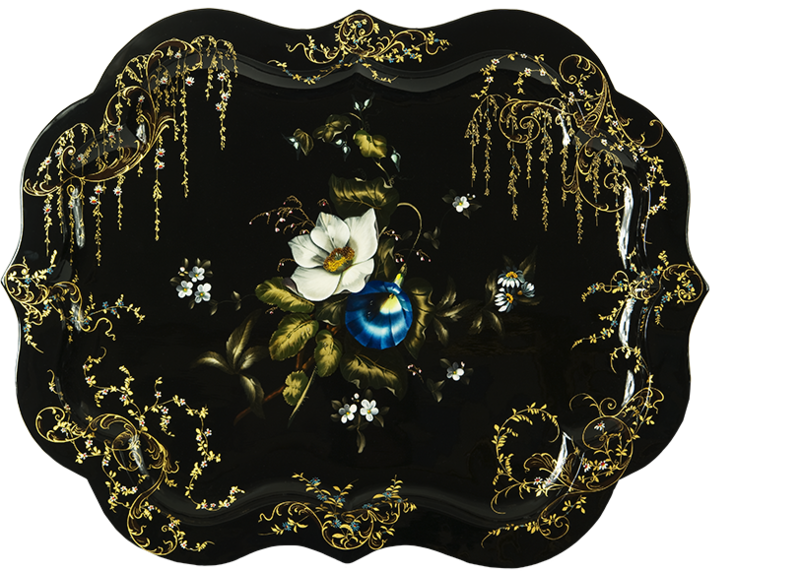 Victorian flower painting also appears on trays, hand screens, boxes, furniture, and other items of exceptional merit made of metal, papier mâché and wood. Pontypool painting is a style of decoration associated with the pierced-edge trays of Pontypool. It is usually composed of flowers, fruits and birds that show great form and depth by contrasting strong textured highlights against deep shadow. Brushstrokes are textured and clean. Colors are rich and bold. Pontypool painting is usually found on metal pierced trays of various shapes, pierced and unpierced gallery trays, and other metal articles. American tinsmiths started painting their tin to make it more durable and added brushstroke painting to make it colorful and saleable. Tin centers in Connecticut, Maine, New York and Pennsylvania sent out tinkers to sell their wares house-to-house and farm-to-farm. Items for sale included trays, boxes, coffee pots, cups, tea canisters, trunks, and other useful housewares. 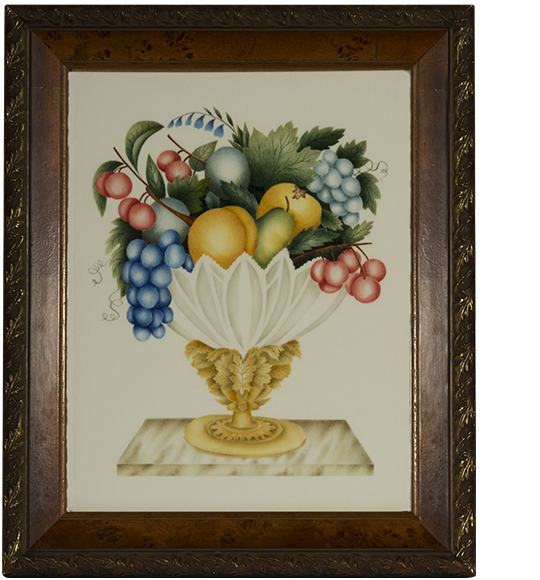 This colorful brushstroke painting became very popular and each tin center had its own style of painting and designs. Freehand bronzing is the application of metallic powders to a tacky varnish base coat, creating a design. 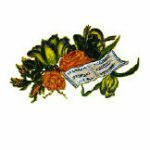 This method of decoration was practiced in the English Midlands in the 18th and 19th centuries. 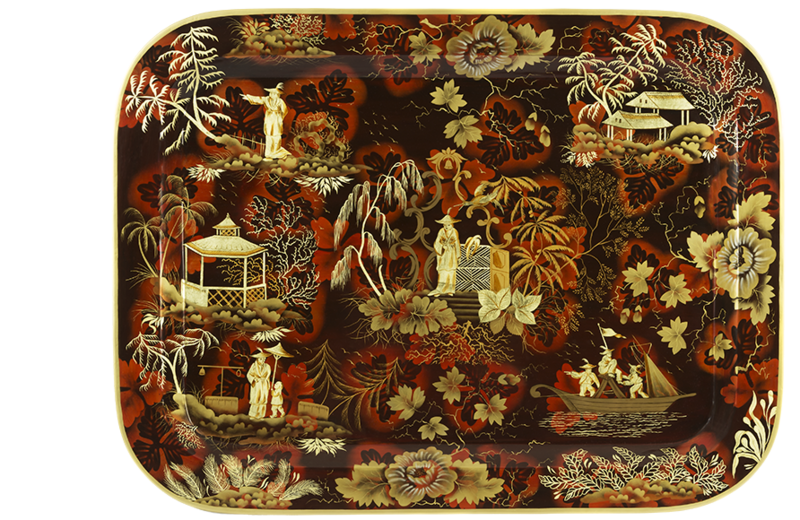 Designs were composed of flora, fauna and scenic views, and are usually found on trays made of metal and papier mâché. This is the technique of applying bronze powders through a stencil onto a tacky varnish base coat. All stenciling is based on skillfully blending powders to form highlights and shadows. 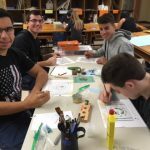 Wood stenciling creates the illusion of a third dimension by skillful, smooth shading. One unit may have more than one color of bronze powder to help show dimension. Wood stenciling is found on chairs, boxes, cornices, and more. 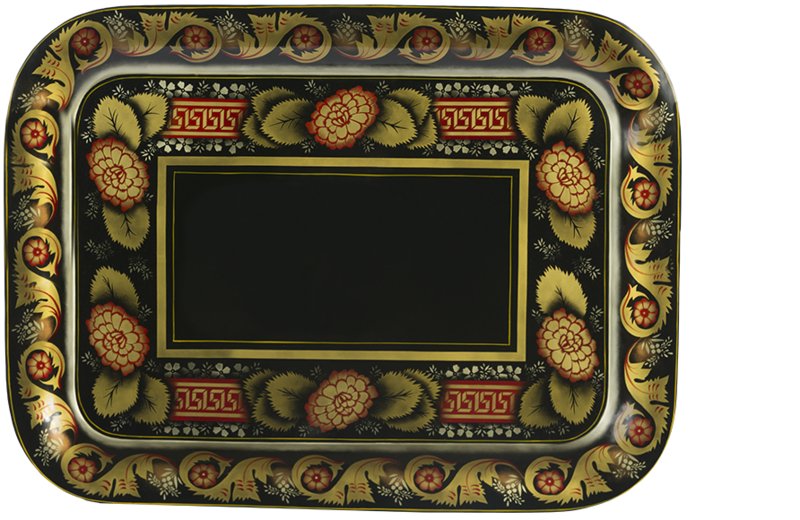 Stenciling on tin is found on metal trays, bread baskets and boxes. Tin stenciling is “tighter” than wood stenciling, and the designs are usually very well balanced with units repeated several times to form the design. Stenciling sometimes has metal leaf, color washes and painting incorporated in the design. Metal leaf painting is the application of metal leaf onto a tacky varnish base coat. Metal leaf can be found with stenciling on tin, stenciling on wood, freehand bronze, Pontypool and Victorian flower painting. Etching and/or fine black brushwork show form and details on metal leaf. Form is also shown by washes of transparent color. Metal leaf is frequently found on trays made of metal and papier mâché. Reverse glass painting involves creating a mirror image of a picture on a piece of glass. The foreground is painted first and the background last, so that the image can be viewed correctly on the opposite side of the glass. 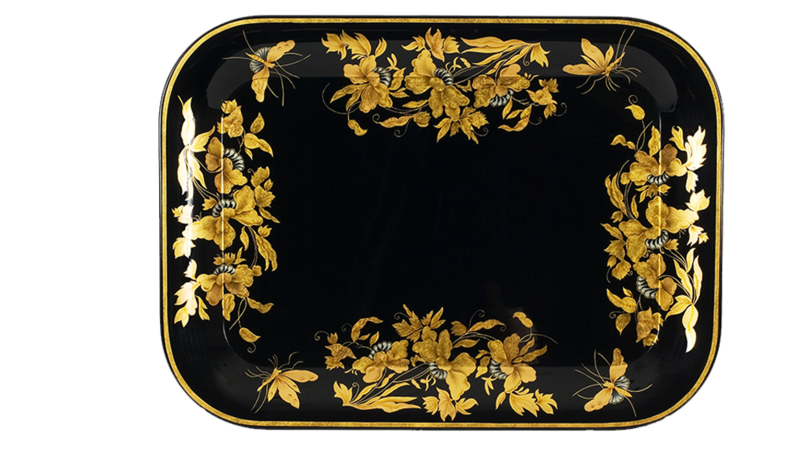 The reverse painting technique is often combined with gilding on glass, which involves applying metal leaf to the back of the glass using gelatin and water size. Once the metal leaf is laid down, a design is etched on the metal leaf and then backed with black paint. The surplus leaf is then washed away, and the rest of the glass is painted using the reverse painting technique. 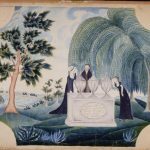 In early America, designs ranged from country scenes and sailing ships, to historical events. Portraits of George Washington were common. Many reverse-glass panels were used to decorate looking glasses and tablet in clocks. 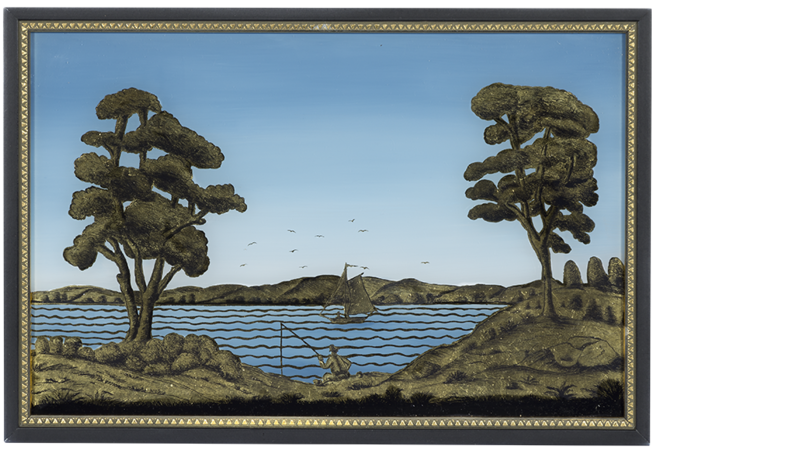 Empire-style panels for mirrors usually had borders of gold leaf, fine stencil designs, or both, with painted landscapes, fruit, and naval scenes. 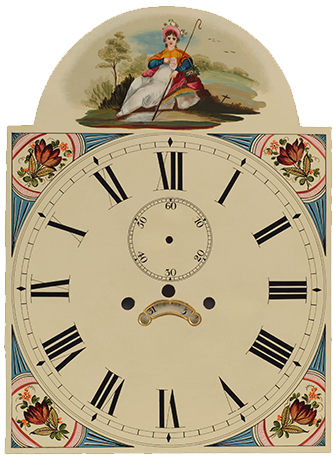 The clock dial has always been a subject for decoration. Subjects are often floral, scenic, pastoral, or nautical; hunting scenes, allegorical figures, and moon dials are also popular. The lettering of the inked time track, the background colors, the use of gesso, oil painting, and gilding on dials are all separate skills that are involved. Theorem Painting is referred to as a mechanical method of painting a picture by applying paint through a series of stencils or “theorems.” Theorem refers to the stencils used, not to the painting itself. It is sometimes called velvet painting as the theorem technique of painting was often applied to velvet (cream or off-white color), paper, silk, cotton, linen, and light colored wood. Still life compositions of fruits and flowers were the most common subjects, along with birds, and butterflies. Landscapes, biblical scenes and mourning pictures were popular from the Early 19th century through the Victorian era. Small, stiff brushes are used and sometimes a finger wrapped with a small piece of wool or velvet is used to create a subtle shading effect. Theorem paintings are painted either in oils or watercolors. Velvet painting came from England and was most popular from 1820-1860. It is sometimes referred to as Poonah painting, from Poonah, India because the “poonah” brush was used. It can also be referred to as Chinese painting because the Chinese stenciled on pith, a paper-like substance with a velvety texture. This art form was popular in Britain during the Regency and Georgian periods. 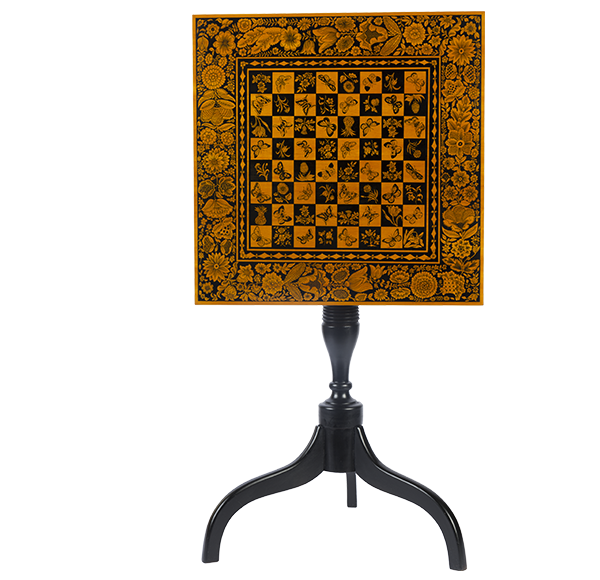 Its effect was to emulate the look of the expensive ebony and ivory inlaid pieces from Vizagapatam, India. Penwork was accomplished by young ladies at home, although there was also a market of professionally-decorated items. Designs were executed with pen and ink on items made of white wood (sycamore, yew, pine, etc.) that had minimal grain. Antique pieces today are aged to a golden amber color. The work was done on tea caddies, ladies’ sewing boxes, small game tables, card boxes, snuff boxes, large case furniture and other fine pieces of woodenware.